The Morris County Park Commission cares for more than 53,000 artifacts within its collection. Over the years, some items have started to deteriorate and are in need of special care. Now you can help by “adopting” one of your favorites. By adopting one of these endangered artifacts, your tax-deductible contribution ensures that these pieces of history will continue to teach us about the past. 2012 marked the 150th anniversary of Charles Foster enlisting in the Union Army during the Civil War. The Grand Army of the Republic organized in 1866 as a veteran organization for the Union Troops. Necessary treatment: stabilization of shattered grosgrain ribbon. Sumi ink, gouache and watercolor on paper. 18th Century. The Tubbs brothers and Ben Blackburn were avid collectors of Asian artifacts. 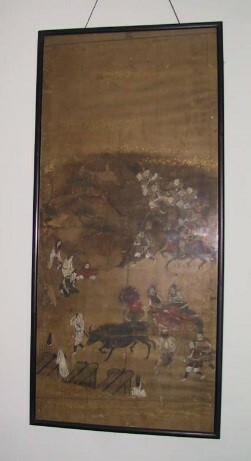 This print depicts a fighting scene. Necessary treatment: surface clean, removal of acidic tertiary support, re-attach delaminated areas and re-house. Level 1 ($25 - $99): adoption certificate, a fact sheet with a photograph and information about the significance of the artifact, group adoptions would also receive artifact activity worksheets. Level 2 ($100 - $200): everything from level one, plus 1 free admission to Fosterfields (or any historic site). Level 3 ($200 - $500): everything from level one, plus 2 free admissions to Fosterfields (or any historic site). Level 4 (anything about $500): everything from level one, plus a free 1-year family membership to the Friends of Fosterfields and Cooper Gristmill. All adoptions are in name only and are for a period of 1 year. Funds raised will support the preservation,storage, and management of our artifacts. The Adopt an Artifact program is supported in part by The Alliance for Morris County Parks, a non-profit organization supporting the programs and facilities of the Morris County Park Commission. A portion of your donation (not to exceed 10%) may be allocated to operations of The Alliance for Morris County Parks. Tax note: The Adopter will be provided with the approximate value of “Benefit” items related to this program along with their contribution receipt. Please consult your personal tax advisor for details on how this affects or applies to your specific itemized tax-donation. You may choose to waive the “benefit” package if you would rather take the total donation value.